On the occasion of Mananeeya Eknathaji Janma Shati Parva, “Yuva Prashikshan shivir” for the western part of Arunachal Pradesh started at VKV Nirjuli for four days comprising of 125 participants covering 10 districts of Arunachal Pradesh to motivate the young generation. Speaking on the inaugural function, Dr. Joram Begi Prant Pramukh Vivekananda Kendra highlighted the life and messages of Eknathaji Ranade the founder of Vivekananda Kendra. In his address Dr. Begi said that Eknathji was the person who translated Swami Vivekananda’s vision into action especially in North – Eastern part of the country. The state is fortunate that Eknathji choose Arunachal Pradesh to start his work. Now Vivekananda Kendra which had a modest beginning in 1977 with 7 Vidyalayas has increased to 34 in the whole state. 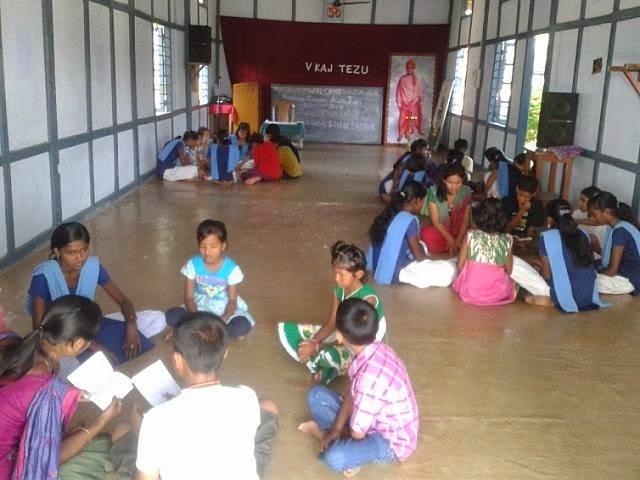 Kendra has started Arun Jyoti for Rural development and Vivekananda Kendra Institute of Culture – Arunachal Chapter for promoting the dialogue to preserve and nurture culture. Swami Supradiptananda Maharaj, Vice principal Ramakrishna Mission School, Narottamnagar, Deomali who attended the program as Chief Guest cited the example of Swami Vivekananda, he guided the youths to have discriminating power to select the positive direction in life. At present there are many attractions to deviate in this youthful age. Dr. Emi Rumi, President Galo Welfare society added that young youths have more tendency to fluctuate in wrong direction which is to be minimized and focus on discipline and sincerity consistence. 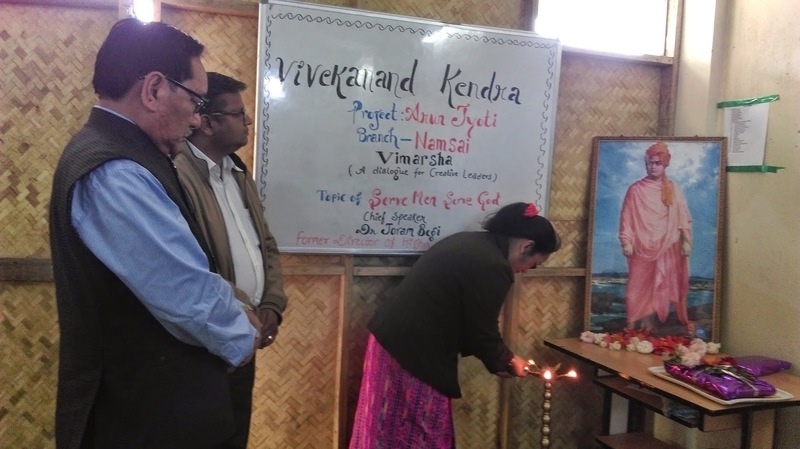 Concluding program of camp was organized on 14th April 2015 at VKV Nirjuli. Sri Gomar Basar, incharg of camp presented camp report in front of chief guest Sri Mutchu Mithi, Hon`ble Parliamentary Secretary, and other guests. Speaking on the concluding function Sri Gomar Basar highlighted main topics of talks given by prominent speakers like Dr. Joram Begi: Prant Pramukh Vivekananda Kendra, Sri Pai Dave: Youth coordinator, Sri Bengia Tolum: President Nyishi elite Soceity, Sri Sange Tashi about Youth for Sewa, Need of Organized Work, Our Culture Our Pride. Training and awareness talk was conducted by experts about Education, Documentation of culture, Health & hygiene and Blood Donation. Sri Mutchu Mithi, Hon`ble Parliamentary Secretary who attended the program as Chief Guest motivated youth by his speech, he guided the youths to do hard work in life. He said there is no shortcut for successes or nothing like luck, if you are hard working, will reach to goal. He mentioned that hard work is the gateway of opportunities. Vivekananda Kendra has constituted committees at various levels to chalk out programmes for the yearlong celebration of Mananeeya Eknathaji Janma Shati Parva. Yuva Sammelan, Janjati Sammelan, at Circle and District Level are some of the immediate activities planned. 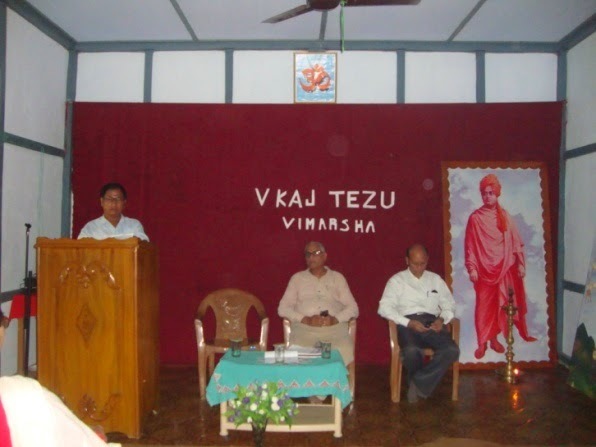 April 08, 2015 The Tezu Branch of Vivekananda Kendra Arun Jyoti is organized Vimarsha (A dialogue for Creative Leaders). The topic was “SERVE MEN SERVE GOD”. Programme begin with lightening the lamp by Vivekananda Kendra Arunachal Prant Pramukh Dr. Joram Begi and welcome speech given by Vyavstha Pramukh Smt.Hage behizane, Nagara Pramukh VKAJ Tezu Shri Kruleso Ngadong highlighted the work of Vivekananda Kendra in Arunachal, Shri P.K. Pandey highlighted the message of Swamiji. Dr. Joram Begi said that every person has the divinity , we should serve the man those who are poor, Illiterate, Ignorant and innocent, Serve to these people mean worship to god, he emphases worship should be selfless, One should not expect by giving only think to give. Serve should be irrespective of cost, color and religious. As a good citizen one should be dedicated and communicated to their duty that is their service to god. End of the Program VKAJ Teju Nidhi Sankalan Pramukh Smt.Reena Sharma given the vote of thanks. Vivekananda Kendra Arun Jyoti organized training camps for Balsevikas, AnandalayaAcharyas and Health Workers at VKV, Jairampur. The camp was inaugurated on 3rd April 2015 by Sri H.Matcha, Retd. ADC of Tirap. 18 Health workers, 25 Anadalaya Acharyas and 63 Balsevikas attended the camp. The participants were from Tirap, Longding, Changlang, Namsai and East Kameng districts from Arunachal Pradesh. Health sessions were taken by the Doctor of Arun Jyoti and Dr. M.Khimhun, DTO, Changlang. Some well-wisher teachers trained the Anadalaya Acharyas. It is to be mentioned that Arun Jyoti is running 92 Balwadis in Arunachal Pradesh. Vivekananda Kendra Arun Jyoti, Branch Tezu has organized “PARIKSHA DE HASTE HASTE five day Workshop” for the Students of Indira Gandhi Govt. College, Tezu on 12th to 16th March 2015 at college Auditorium. 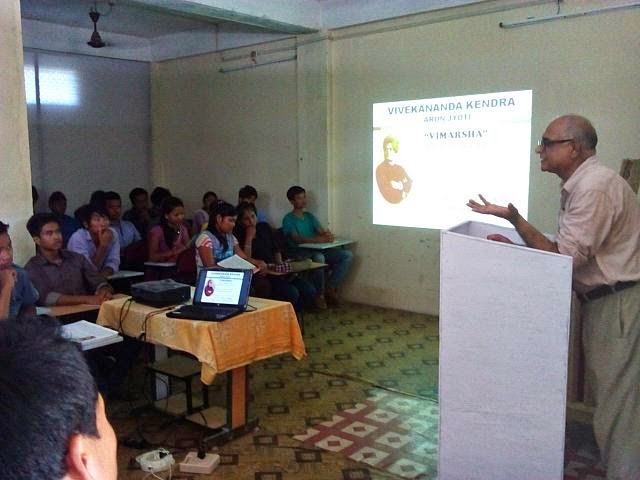 Sessions on various examination related topics and issues, such as concept of examination, concentration, memory power, importance of yoga for stress management, memory game etc were conducted by resource person Ashok Atale, Nagar Sangathak, Vivekananda Kendra, Tezu in the workshop which was titled “Pariksha De Haste Haste”. Earlier, Shri Kruleso Ngadong, Nagar Pramukh, Vivekananda Kendra, Tezu inaugurated the workshop. The Free Operation Camp organized by Vivekananda Kendra Arun Jyoti in association with Department of Health and Family Welfare, Govt. of Arunachal Pradesh and Remote Area Medical, Knoxville,USA concluded successfully on 14th February 2015. A team of nine NRI Doctors participated in the camp, which was inaugurated on 9th February 2015 by the Deputy Commissioner of Changlang, Mrs. Chanchal Yadav. The team conducted 68 major and minor surgeries successfully during the camp. 132 endoscopies were done by NRI Gastroenterologist free of cost. A total 401 outpatients were examined by the NRI doctors and medicines were given accordingly. Patients from Changlang, Tirap and Lohit district came in large numbers to avail the opportunity. To make this endeavor a success, various segments of society came forward with their whole hearted participation like the Medical authority and staffs of District Hospital, Changlang, District Administration, Local MLAs and other local organizations. It has to be mentioned here that our well wishers from far off places like Gujarat also helped us by sending medicines that were used in the camp. The participation of the local people during the camp was overwhelming. The youth wing of Rangfraa Faith Promotion Society (RFPS) provided volunteers, who worked day and night to make the camp successful. It is to be mentioned that this was the ninth yearly operation camp by the Remote Area Medical Volunteers and till date we operated more than 400 poor and needy patients of Arunachal Pradesh and Assam. The faith that the people have on the smooth conduction and transparency of the camp inspired the whole team and encouraged the NRI team to visit and serve here time and again. 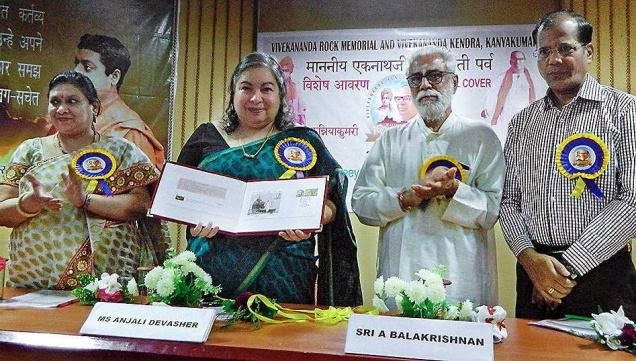 A special postal cover brought out by the Department of Posts to mark the centenary celebrations of Ekanath Ranade, founder of Vivekananda Rock Memorial and Vivekananda Kendra, was released here on Friday. Anjali Devasher, Chairperson, Investment Board and Postal Service Board, released the special cover at a function held in Vivekananda Kendra Auditorium. Ms. Anjali Devasher said that the special postal cover on Eknath Ranade was released to honour a great leader by the Department of Posts. My Stamp was released by T. Murthy, Chief Postmaster General, Tamil Nadu Circle. D. Bhanudas, general secretary, Vivekananda Kendra, received the special postal cover and My Stamp. A. Balakrishnan, vice-president, Vivekananda Kendra, presided. J. Charukesi, Postmaster General, South Zone, and office-bearers of Vivekananda Kendra attended the function. Prior to the release of special postal cover and stamp, a short film on Eknath Ranade was screened at the auditorium. P. Krishnaswami, Administrative Officer, welcomed the gathering and M. Hanumantarao, treasurer, proposed a vote of thanks. As a next level for the winners of circle level, District Level Traditional Dance and Drama Competition was organized at Yingkiong, the headquarter of Upper Siang District of Arunachal Pradesh, along with the National Youth Day on 12th January 2015. Shri Nobang Borang, Ex-ZPM, Chief guest of the programme highlighted on the education system, also with the effect of western culture on our youth and to maintain the identity of our culture. He also encouraged the indigenous faith and belief, which is the motto of this celebration. He appreciated the work of Vivekananda Kendra for the upliftment of our tradition and culture. Shri N. Nitik ZPM-Tuting, Guest of honour warn that as ours is an oral tradition, no written form is there, it is vulnerable to be extinct someday. Shri Sanjeeb Kar, Teacher, VKV Yingkiong welcomed all after the lightening the lamp by chief guest along with invocation prayer. Shri Ambuj Thakur, highlighted about the importance of the National Youth Day. He narrated about the life history of Swami Vivekananda. Shri Taba Tatup, Prant Karyalaya Pramukh, Vivekananda Kendra, highlighted about the yearlong celebration of Mananeeya Eknathji Janma Shati Parwa and the objective of Traditional Dance and Drama Competition and the works of Vivekananda Kendra in Arunachal Pradesh. He emphasized on preservation of the rich traditions and culture of our tribes. Accordingly, by practicing, promoting, and protecting one can preserve one’s own traditions and culture. Four Dance groups and three Drama groups of participants performed after a patriotic song and a dance performance by the VKV Yinkiong students. The judges pannel was inclusive of Shri Rupir Boli, District convener, Shri Oyem Kartek and Shri Durik Apang, personalities having a very deep knowledge of their tradition and culture. To celebrate year long programme of Mananeeya Eknathji Janma Shati Parwa,Circle level Traditional Dance and Drama Competition was conducted on 31.12.2014 with the celebration of Donyi Polo Day in Mini Stadium, Liromoba. All the five participant groups performed with according to the rules and regulations only. Total 132 youths were involved as participants. These groups were named as Vivekananda group, Eknathji group, Talom Rukbo group, Donyi Polo group, and Bopu youth group. On this auspicious occasion Su. Priyanka Gupta, Siang Vibhag Sanghatak Vivekananda Kendra, Pasighat deliverd a very significant lecture. She told that everyone must know about Mananeeya Eknathji Ranade, who is the founder of Vivekananda Kendra and his vision to open the schools and also interest to work in the North Eastern Region. A great competition was successfully conducted by the circle level team at Liromoba. Vivekananda Kendra, Arunachal Pradesh organized “Traditional Dance and Drama” competition on the occasion of Mananeeya Eknathji Janma Shati Parva and Samarth Bharat Parva. We touched 57 circles and 12 districts out of 120 circles and 18 districts of Arunachal Pradesh. More the 192 teams and 2500 youths participated from 25 December 2014 to 12 January 2015 were circle level and district level competition was conducted. We formed the 45 committees for that purpose. The competition was totally based on traditional music instrument, traditional song with Traditional Attire and local dialect. No recorded song & no electronic gadgets were used. The 1st December to 30th December “Indigenous month” was declared by the Indigenous Faith and Culture Society of Arunachal Pradesh (IFCSAP) to engage the indigenous people for Shakti pradarshan and Shakti samvardhan. “Traditional Dance and Drama” competition doubled the enthusiasm of our people and karyakartas and gave a great impact on the Arunachlee society that almost a month the cultural atmosphere was created and it gave the confidence and a festive mood to all indigenous people. Very enthusiastically people participated from the border area of china and Myanmar like tuting circle of upper siang district, chaglagam circle of anjow district, khimiyong circles of changlang district, lajo circle of tirap dictrict and ponchoo circle of longding district. At Chagalgam an elderly person of mishmi community after listening the life and message of Eknathji he not only makes a song on Eknathji in mishmi dialect but also sang in front of all the public. At manmow, a remote circle head quarter, people participated beyond our expectation. It is Christian and militant dominated circle but villagers practiced well and demonstrated traditional drama in which priest chanting and rituals were also there. It inspired us and gave a motivation that there is a spark in their core of heart for Culture and faith. Chimpu area near to itanagar the state capital also dominated by Christian population when our karyakarta contacted there was no response because all were busy in the preparation of Charismas. After pushing 2nd time and seeing the publicity through posters they saw the prize money they got attracted and leaving there church activity they started practicing the Traditional Dance and Drama with full involvement. Many samiti members took the responsibility and work hard to organize the Traditional Dance and Drama in their respective circle. The convener of Yingkiong Sri Ropir Bole took the responsibility for tuting circle the remotest area. He nicely conducted the competition and brought the toppers to participate in district level. 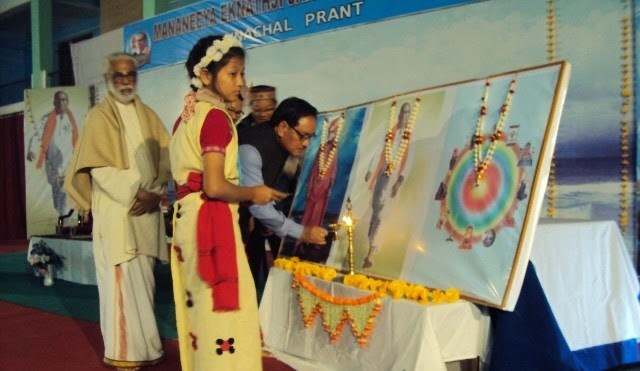 As part of Eknathji’s 100th Birth Anniversary celebration, a Traditional Drama and a Traditional Dance competition were held in the premises of VKV NEEPCO Yazali on 5th January 2015. Mananeeya Eknathji Ranade, the true follower of Swami Vivekananda founded VKVs across Arunachal Pradesh to illuminate this remotest part of India with education. Being a serious devotee of Swamiji, Eknathji Ranade had his dream to liven up the cultural roots of different peoples, living in our country and give her a bold and proud identity in the eyes of the world. Traditional Drama and Dance competitions which are being held at different locations in the state, in connection with Eknathji’s Birth Centenary celebration, is the untiring effort by his disciples to make that great man’s dream come true. Gaonburah Sri Tao Tebiji and Chairperson Smt. Nibia Pomin along with other enthusiastic villagers came forward to help in organizing the competitions. It was a promising sight to see the packed crowd in the school assembly ground to witness the competitions and encourage the competitors. In Drama competition Billo Village bore away the first prize with a cash Rs. 5000.00 Poosa Village and Chullyu Village respectively stood second and third in the competitions winning Rs. 3000.00 and Rs 2000.00 In Dance competition also Billo village stood first and Poosa village stood second. The third position was occupied by Pitapool Colony. The same amount of money was given as prizes as in Drama competition. The first prize winner Billo Village enacted a purely traditional ritual which is done to ward off evil spirits from the village which are believed to cause diseases to the villagers. Poosa village staged a drama enacting how a girl is taken away by force for marriage. Chuliiyu village showed in their drama how some villagers are ignorant of the importance of education for their children. Sri Tania Taji, Senior manager, RHEP. NEEPCO Yazali was invited as the chief guest to witness the competitions. The President of Nyishi Society Sri Bengia Tolumji graced the occasion as one of the judges in the competitions.The two other judges were Sri Chukhu Kochiji, Principal, Secondary School, Pitapool and Sri Dakken Karlo, Senior Accountant, RHEP, NEEPCO, Yazali. The distinguished persons lauded the effort made by VKV NEEPCO Yazali in its endeavour to promote traditional culture. The Circle Level TRADITIONAL DANCE & DRAMA COMPETITION was held at CALSOM Hall by Vivekananda Kendra, Tezu, Arunachal Prant as a part of the yearlong celebration of Mananeeya Eknathji Janma Shati Parva. The Programme had 10 teams participation. The special guests for the programme were Shri Promso Marap Vice-Principal Govt. Hr. Sec. School Tezu and Shri Boklelum Tega Chairman CALSOM. There was other investees and few parents. The programme started with invocation by special guests. Smti. Sailu Billai VKV Principal & Co-coordinator MEJSP Tezu welcomed the guest and other dignitaries. The judges for the competition were Shri Agramso Kri, Smti. Y. Tamblu and Shri Soloi Ngadong. Pomliang village team was 1st and Tafrogam village 2nd in Traditional dance competition Tafragam village got 1st in Drama Competition. The first teams will be taking part at the district level competition on 12th January 2015. During this program Speech was given by Smti Saili Billai highlighting the life history of Eknathji, He was instrumental in establishing several Vivekananda Kendra works in the remote part of Arunachal Pradesh to impart the qualitative education, like VKV, VKAJ. Shri Promso Marap distributed the prize to the winning team and Shri Kruleso Ngadong, Nagar Pramukh Vivekananda Kendra Tezu extended the vote of thanks. The circle level competition for the Traditional dance on occasion of MEJSP was conducted at Vivekananda Kendra Kharsang. There were three troops for the traditional dance competition. Shri Mihin Tamin , Principal, Govt. H.S.School,Kharsang, was the Chief Guest of the this programme. About 150 students and 55 well-wishers witnessed the programme. The programme was started with the lighting of lamp by the Chief Guest, followed by the welcome address from Shri Putun Techi. The Key-note address was delivered by Shri Keshab Upadhayay, Coordinator from VKV-Kharsang for MEJSP. In his speech the aims and objectives of the programme with life and message of Man. Eknathji was explained elaborately. It was followed by the speech of Shri Mihin Tamin, Chief Guest. He highlighted the importance of indigenous culture and appealed the public to protect it for the future generations. The programme was started with the lighting of lamp by the Chief Guest, followed by the welcome address from Shri Satish Gogoi, Convener, MEJSP of Diyun circle . The Key-note address was delivered by Shri Keshab Upadhayay, Coordinator from VKV-Kharsang for MEJSP. In his speech the aims and objectives of the programme with life and message of Man. Eknathji was explained elaborately. It was followed by the speech of Shri Nikh Kamin. All the dignitaries and three judges were felicitated by the committee members of MEJSP of Diyun circle. It was followed by the traditional dance competition from seven local troops and then traditional drama competition from seven troops. The prizes to the winners are given by Shri S. Meji, ADC, Bordumsa. The programme was concluded with Shanti mantra.The circle level competition for the Traditional dance and drama on occasion of MEJSP was conducted at Diyun. There were seven troops for the traditional dance competition and seven troops for traditional drama competition. Shri Nikh Kamin , Hon’ble MLA was the Chief Guest and Shri S.Meji, ADC, was the Guest of Honour for the this programme. About 1050 people witnessed the programme. 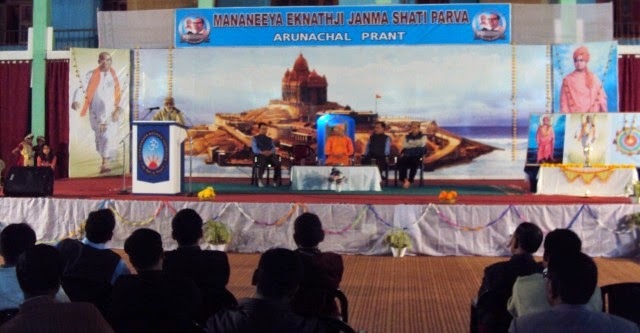 The State level (Arunachal Prant) launching of Mananeeya Eknathji Ranade Janma Shati Parva was conducted in VKV Nirjuli on 2nd December 2014. Dignitaries: Mananeeya A. Balakrishnanji, Vice President, Vivekananda Kendra, Kanyakumari, Dr Joram Begi, Prant Pramukh, Vivekananda Kendra, Arunachal Pradesh, Dr Tejum Padu, Sah Prant Pramukh, Vivekananda Kendra, Arunachal Pradesh, Parents of VKV Nirjuli, Well Wishers, etc. The Chief Guest of the occasion was Swamiji Maharaj, RK Mission Itanagar. In addition, more than 370 people had gathered in VKV Nirjuli auditorium to grace the occasion. Focus: Mananeeya A. Balakrishnaji in his introductory address narrated his journey of life to serve the motherland to the fullest. He went on to say the difficulties faced in 1970s in Arunachal Pradesh to guide and instill the value of life in general and education in particular. He also shared the gathering the inspirations and guidance all the workers of Vivekananda Kendra received from the legendary personality Mananeeya Eknathji Ranade. “Swamiji’s vision was the mission of Ma. Eknathji and all the Kendra workers were streamlined to emulate the sermon under the active support and guidance of Ma. Eknathji Ranade”, Ma. Balakrishnanji told in his speech. 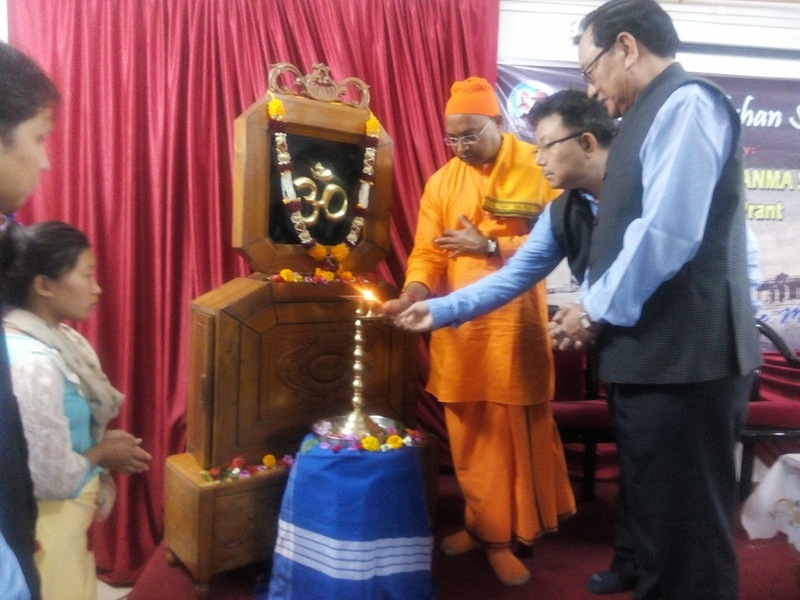 The Secretary Maharaj, RK Mission, Itanagar in his inaugural address highlighted a few components of Swami Vivekananda’s visions and His calls to the youths of India. Traditional Dance & Drama Competition organized at Community Hall Chaglagam. In connection with the yearlong celebration of 100th year Birth anniversary of Sri Eknathji Ranadeji, Traditional Dance and Drama Competition conducted by Chaglagam Circle, Community Hall Chaglagam. Smti. Mailu Tega coordinator MEJSP Chaglagam, welcomed the guest and other dignitaries. Sri B.K. Singh, Principal VKV Ameliang, Highlighted the yearlong celebration of 100th year Birth anniversary of Eknathji. During this program Speech was given by Sri Ashok Atale, Nagar Sangathak Vivekananda Kendra Tezu They have focused the life history & works of the founder of Vivekananda Kendra, Eknathji Ranade who actualized the vision of Swami Vivekananda, Sri Eknath Ranadeji to uplift the people of North East as a whole and Arunachal Pradesh in particular. “He was the instrumental to establish several Vivekananda Kendra in the remote part of Arunachal Pradesh to impart the qualitative education”, he said. There were 03 (Three) teams to take part in the competition coming from in and around Chaglagam Circle. A variety of traditional dance were performed by the teams in a well attended hall. The “China Border” group has been adjusted as the winning team. Smti. Mailu Tega, distributed the prize to the winner teams. Shri Thaliso Tega, Chaglagam, Saha-Pramukh, MEJSP extended the vote of thanks. The circle level traditional dance and drama competition was conducted at Vivekananda Kendra Branch Bordumsa as part of Eknath Ranade’s birth centenary celebration. The first prize in traditional dance competition was bagged by Wakhetna village while the second prize was won by Kherem Kachari village. The first prize in traditional drama competition was bagged by Gidding village. Eight teams participated in traditional dance competition and three in traditional drama. MLA Nikh Kamin, Head Gaon Bura Sekhet Tang Singpho, ZPM Tonko Singpho witnessed the programme among others. A similar competition was also organized at Diyun wherein Innao village bagged the first prizes in both traditional dance and drama competition and Deori village the seconds. There were seven troupes for the traditional dance competition and as many teams for the traditional drama competition. In connection with the yearlong celebration of 100th year Birth anniversary of Sri Eknathji Ranadeji, a Traditional Dance Competition and Drama Competition conducted in circle level by Vivekananda Kendra Banderdewa on 29th December 2014 at PTC Banderdewa in which nearly 550 people were present to witness the programme. Sri T. M. Sathian, Principal VKV PTC Banderdewa welcomed the august guest and other dignitaries. Sri S. Sumnyan, Superintendent Engineer Trans- highway graced the occasion as chief guest. While addressing the audience, he highlighted the significance of Arunachal Dance and unique costumes. “Arunachal dance and Unique costumes is our identity” he said. This rich tradition must be preserved for our existence as well as for next generation, he continued. He expressed his deep appreciation to the state organizers and VKV’s in particular by organizing such type of programmes. Sri SNS Yadav, Sr. Hindi Teacher- VKV PTC Banderdewa highlighted the contribution of Sri Eknath Ranadeji to uplift the people of North East as a whole and Arunachal Pradesh in particular. “He was the instrumental to establish several VKV’s in the remote part of Arunachal Pradesh to impart the qualitative education”, he said. There were 05 (Five) teams to take part in the competition coming from in and around Banderdewa. A variety of traditional dance were performed by the teams in a well attended hall. The “Galo Neli Komji” group (PTC) has been adjusted as the winner team and qualified to attend the District level competition. 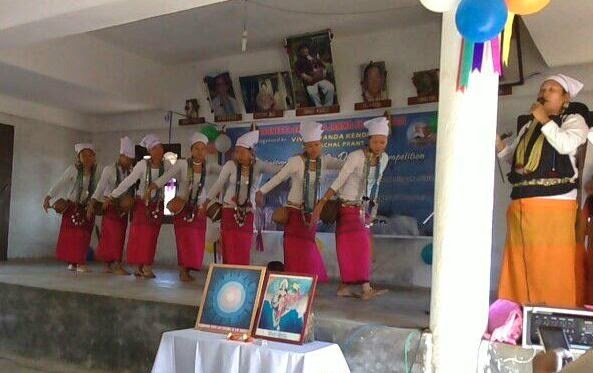 TRADITIONAL DANCE & DRAMA COMPETITION organized at Donyi –Polo Dere Likabali by Vivekananda Kendra, Arunachal Prant as a part of the year long celebration of Mananeeya Eknathji Janma Shati Parva. Sri Maryon Karlo, CO likabali and also the president of Donyi – Polo welfare society and Dr. N. Lombi was the judge in this circle level competition. Vivekananda Kendra Arun Jyoti recently organized a few free medical camps at Khalaktang circle of West Kameng district, Arunachal Pradesh. Camps were organized at Angkling, Waringpam, Chamdrung and Brokpublaching villages. All these villages are very remote and road communication is a real problem. It is to be mentioned that Chamdrung is the last village of India and is very near to Bhutan. 157 patients were examined in these camps and free medicines were distributed. Most of the patients were suffering from worm infections and skin related diseases. The Doctor of Mobile Medical Team of Vivekananda Kendra Arun Jyoti and Dr.K.Deru, M.O. of Shergaon PHC treated the patients of these remote villages. Sri Sange Tashi, ZPM,Rupa and the yuva manch pramukh of West kameng district accompanied the team and gave valuable guidance. Vivekananda kendra Arun Jyoti, Tezu organised “VIMARSHA” program a dialouge for creative leaders topic on ‘Timeless India - Resurgent India’ at VKV hall Tezu. Dr. J.K. Bajaj, Director centre for policy studies, New Delhi, as a Guest Speaker spoke on Timeless India Resurgent India with special focus on Himalaya range as stated natural great wall of India with potentiality of natural resources. Present audience raised many questions on above topic and chief speaker gave the answers to satisfy the audience. This session was very vibrant due to number of question asked. Nagar Pramukh Shri Kruleso Ngadong gave a welcome speak and introduction of the guest speaker Dr.J K Bajaj. Shri Ashok, Nagar Sanghatak of Vivekananda Kendra gave brief introduction of Vivekananda Kendra Arun Jyoti and its various service activity. More than 70 intellectuals from all walks of life attended the function. Dignitaries of Cultural and literacy society of Mishmi (CALSOM) attended the program, Like Chairam Er. Bajai Pul and Secretary Shri Amoso Khamlai. Vice Principal of IGG College, teachers of Higher sec.school and other govt. schools, officers, Public leaders and General Public attended the program. Vimarsha Pramukh and Principal VKV Tezu, Smt. Sailu Bellai gave vote of thanks. The Program was concluded with shanti mantra as per Indian tradition. Vivekananda Kendra Arunjyoti ,Itanagar celebrated Guru Purnima on 20/07/2014 at Central Nyedar Namlo,Doimukh. The programme started with the lightening of lamp by shri Joram Begi , Director of Higher and technical Education, and Prant Pramukh of Vivekananda Kendra ,Itanagar. The occasion was conducted in the presence of Shri.Nabum Atum , President of Central Nyedar Namlo, Doimukh and other members and devotees of the Namlo in the Rono Auditorium. Sushri Sutapa Roy ,Nagar sangathak recited the shanti paath followed by Deshbhakti geet by Miss Pura Aku. Shri Taba Tatup ,Prant Karyalay Pramuk of Vivekananda Kendra , AP gave a brief introduction about Vivekananda Kendra and it’s various service activities in Arunachal Pradesh. In his introduction ,he talked about the seed of Swami Vivekananda being sowed in Arunachal Pradesh through Vivekananda Kendra Vidyalayas and various other formal and informal education centres . He also emphasized on the various vocational centres carried out by the Kendra in order to empower the women both socially and economically. Further he cited about the ‘ MAN- MAKING AND NATION BUILDING ‘ the motto of Vivekananda Kendra. Dr. Joram Begi, highlighted the importance of Guru Purnima . He urged the youths to carry out the age old tradition of ‘Guru-Shishya Parampara’. He stated that “What I am today is only due to the blessings of my Guru” .He also mentioned about the importance of Nyibu and advised everyone to respect and value the Nyibu who is seen as the promoter and protector of our old indigenous traditions and culture of Arunachal Pradesh. Later, Dr.Joram Begi, Prant Pramukh of Vivekananda Kendra felicitated Beloved Nangbia Taji, the Nyibu of Central Nyedar Namlo, Doimukh , with a citation and a memento for his sincere and dedicated effort to revive and restore the age old indigenous heritage of the Nyishi community and to the Arunachali society as a whole. Shri.Nabum Atum, President of Central Nyedar Namlo, Doimukh also guided the participants of the programme and thanked Vivekananda Kendra Arunjyoti for taking such a moral initiative to felicitate the priest. 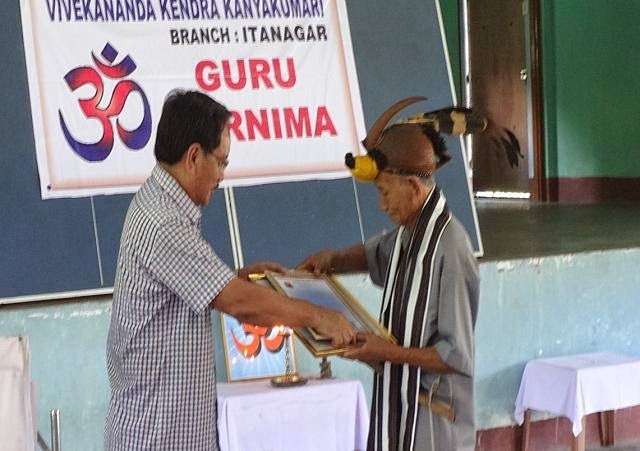 Every year Vivekananda Kendra Itanagar organizes such felicitation programs in order to recognize the yeoman services being rendered by various elders and priests of the society to promote their indigenous faith. The Universal Brotherhood Day was celebrated at three places of Tirap vibhag by Vivekananda Kendra Arun Jyoti on 11th Sept.2014. To aware the youths about blood donation, Kendra organized blood donation awareness camp at Changlang at DIET Auditorium. A free blood group checking camp was also a part of this occasion. 25 youths registered their names to donate blood, when needed. Dr.M.Ngemu, Blood Bank In-Charge, District Hospital,Changlang explained the benefits of blood donation. Dr.D.Techai, District Vetenery Officer, Changlang, chaired the function. Similar blood group checking camp was organized at NBF hall, Khonsa ,Tirap, where 35 youths checked their blood group.Dr.T.Matey, SMO and Dr. P.R.Rakshit, SMO, District Hospital,Khonsa initiated the programme. Sri N.Tangjang, District Labour Officer, Khonsa delivered the concluding remarks. At Deomali one youth camp was organized on the occasion of Universal Brotherhood Day on 11th Sept.2014. Sri Wangpha Lowang,Ex-MP was the chief guest and 117 youths participated in that camp. Vivekananda Kendra Arun Jyoti organized Samartha Prashikshan Karyasala (Trainer’s Training Workshop) at VKV,Tinsukia for the teachers of Arunachal Pradesh. 15 teachers and other professionals from Tirap,Changlang and Lohit districts of Arunachal Pradesh and Assam participated in this three days workshop. A total 8 karyakartas from Vivekananda Kendra also participated in this workshop. The workshop was inaugurated on 24th August and concluded on 27th August. Ma.Nidevita Bhide, All India Vice President of Vivekananda Kendra Kanyakumari addressed the participants and guided to overcome challenges face by teachers through the concept of oneness. Su.Alkagauri Joshi, Prant Sangathak of Punjab and Haryana was the resource person. As it was a trainer’s workshop, the participants plan to organize the same workshop in various places of Arunachal Pradesh in near future.